30th match of ICC Worldcup 2015 has been played between Ireland and Zimbabwe at Bellerive Oval, Hobart today. Putting into bat first by Zimbabwe, Ireland with helps of EC Joyce 112 and A Balbirnie 97 runs managed to put huge score of 331 runs for Zimbabwe to achieved. Zimbabwe in reply played superb cricket and gave good fight with splendid batting performances of skipper BRM Taylor 121 and SC Williams 96 runs but, lost the match by just 5 runs in end. EC Joyce (Ireland) declared man of the match for his 112 runs. Earlier, Zimbabwe won the toss and put Ireland into bat first and set target fo Zimbabwe. Ireland lost PR Stirling early scoring just 10 runs. but, EC Joyce joined with skipper WTS Porterfield and played splendid inning of 112 runs. A Balbirnie also contributed well 97 runs of just 79 balls before he un-fortunately got run out. 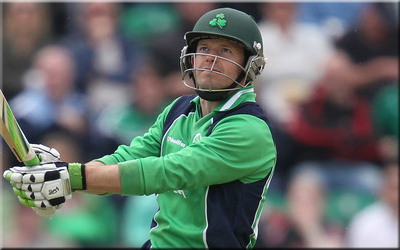 Other middle orders played good quick cricket and Ireland managed to put huge score of 331 runs at the end of 50 overs. Following huge target of 332 runs, Zimbabwe top orders failed to stood in middle for long and continuously lost wickets in regular interwals. But, skipper BRM Taylor and SC Williams took charge in hand and played super fine innings for Zimbabwe. SC Williams made 96 runs and skipper BRM Taylor contributed 121 runs of just 91 balls. Match turns in close finished but, Ireland players hlod nerves well and won the match by just 5 runs. Zimbabwe all out scoring 326 runs in 49.3 overs.